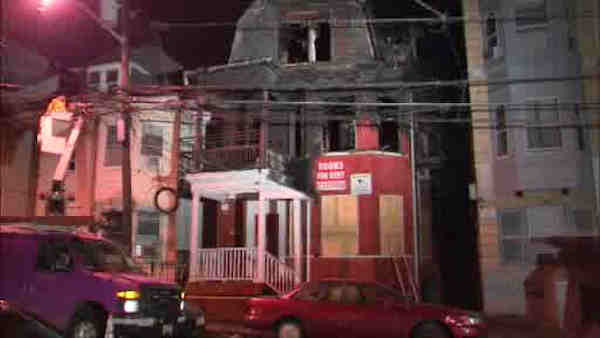 A two-alarm fatal fire at a Paterson building broke out Tuesday at 56 Park Ave., just after 7:30 p.m.
PATERSON, New Jersey (WABC) -- A two-alarm fire at a Paterson building left one person dead Tuesday night, according to Mayor Jose "Joey" Torres. Firefighters responded to a blaze at 56 Park Ave., just after 7:30 p.m. to find the second floor of the building fully engulfed in flames. The fire was under control by 11 p.m. One person was pronounced dead. At least 20 residents were displaced, and the American Red Cross is assisting. The cause of the fire is under investigation by the Passaic County Prosecutor's Office.